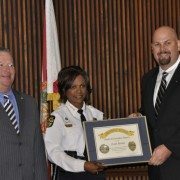 (Orlando, FL November 8, 2010) At a ceremony honoring those citizens who provided assistance to the victims and the investigative efforts of the Orlando Police Department in the aftermath of the Gateway Plaza workplace shooting, Orlando Chief of Police Val Deming presented Leica Geosystems employee Frank J. Hahnel, III with OPD’s Good Citizen Award for his on-scene assistance in documenting the homicide scene using Leica’s ScanStation C10 3D laser scanning technology. Hahnel is an Orlando resident and is Leica Geosystems’ Accident Investigation Account Manager for North America. It was on November 6th, 2009 that Jason Rodriquez opened fire on former colleagues at the engineering firm he had been let go from killing one and injuring five. Hours later Orlando Police tracked Rodriquez to his mother’s home where he peacefully surrendered. The crime scene left behind was a large and daunting one encompassing most of the eighth floor of an office building where Rodriguez had stalked the hallways shooting his victims. Shortly after securing the crime scene the OPD reached out to Hahnel who had only recently provided a demonstration to the agency on the capabilities of the ScanStation C10. The ScanStation C10 is an eye-safe and easy-to-use portable 3D laser scanner that can both panoramically photograph a scene and then capture over 3.5 million survey quality measurements in less than two minutes. The technology is used by law enforcement agencies all over the world for crime scene investigation, vulnerability and threat assessments, post-blast investigation, police action inquiries, accident investigations and more. Hahnel responded to the call-out and systematically scanned the crime scene from 45 different perspectives to document the scene in 3D. “The ScanStation cut the time required to do our work in half by eliminating the need to manually measure the scene” said Karen Livengood an OPD Crime Scene Investigator. “Additionally, the data from the ScanStation lets you virtually walk through the crime scene in 3D, which makes for a clearer presentation to the jury in court” she added. Following the award presentation by Chief Deming and Orlando Mayor Buddy Dyer, Hahnel expressed his sympathy for the victims and his appreciation for being recognized. “Helping with the investigation was a life-changing event for me as I had never seen the results of such a violent crime. I am grateful to have been able to help the police in the community in which I live”. Leica Geosystems launches a dedicated forensics program for law enforcement at this year’s worldwide 3D laser scanning conference. As part of its eighth annual Worldwide User Conference devoted to 3D laser scanning in San Ramon, California, USA (near San Francisco), Leica Geosystems successfully launched a program devoted specifically to the law enforcement and public safety community. The event drew law enforcement agencies and forensic professionals from around the United States and the world over a four day period October 24-27, 2010. Of special interest was the seven-hour “live fire” shooting reconstruction workshop titled “3D Laser Scanning of Shooting Scenes and Trajectories” taught by Mike Haag of the Albuquerque Police Department’s Major Crime Scene Team. Mr. Haag has used the Leica ScanStation on dozens of cases for shooting reconstruction and he is a Distinguished Member of the Association of Firearms and Tool Mark Examiners. Over 30 law enforcement professionals attended this class on a very rainy and wet Sunday at the Contra Costa County Sheriff’s Department who provided their facility. The weather didn’t inhibit the operation of the Leica ScanStation C10 or the enthusiasm of the class which learned the fundamentals and best practices of shooting incident reconstruction and trajectory measurement using 3D laser scanning. The Leica Geosystems ScanStation C10 is an easy-to-use, compact and portable 3D laser scanner that measure 3.5 million points at a scene in less than two minutes in any lighting conditions. The system does not require any special eye protection when used, is robust and captures the leveled survey-quality data required for accurate crime scene reconstruction and analysis. Dr. John DeHaan, of California-based Fire-Ex Forensics, Inc. an internationally recognized expert in his field and the author of Kirk’s Fire Investigation was the first speaker in the general session with a presentation titled “Documenting Fire and Explosion Scenes with Leica ScanStation Technology.” After guiding the audience through multiple cases including a home destroyed by a gas leak and an ambulance (VBIED) rigged with an explosive device as a test exercise Dr. DeHaan itemized 11 significant benefits and advantages of Leica’s ScanStation technology over other methods. Leica Geosystems—when it has to be right. With close to 200 years of pioneering solutions to measure the world, Leica Geosystems is trusted by professionals worldwide to help them capture, analyze and present spatial information. The company is best known for its broad array of products that accurately capture, model quickly, analyze easily, visualize and present spatial information. Based in Heerbrugg, Switzerland, Leica Geosystems is a global company with tens of thousands of customers supported by more than 3,500 employees in 28 countries and hundreds of partners located in more than 120 countries. Leica Geosystems is part of the Hexagon Group, Sweden. Leica Geosystems announces three new laser scanning software products for scan data import, forensic scene mapping, and modeling complex 3D surfaces. Combined, these products increase the breadth and depth of laser scanning software solutions available from Leica Geosystems. A new, standalone Cyclone IMPORTER module is part of the separately announced, enhanced Cyclone 7.0 software suite. This new “open systems” module enables the direct use by Cyclone of scan data. Direct import of native data formats avoids conversion steps to neutral formats that can be time consuming and that are generally not as efficient for downstream data processing. Overall, it lets users of scan data from 3rd party scanners take better advantage of the broad capabilities in the Cyclone suite of software. ForensicMap Pro, developed by MicroSurvey, is available exclusively from Leica Geosystems. It builds on the strength of MicroSurvey’s existing software for mapping forensic scenes and incidents and takes advantage of Leica’s point cloud engine technology. With the addition of point cloud processing capabilities in mapping software specific for them, forensic professionals can now take further, direct advantage of the richness and completeness of 3D High-Definition SurveyTM data for forensic investigations, a high growth area for laser scanning. 3DReshaper software, a powerful, standalone software for working efficiently with large, complex meshes and comparing them against designmodels, has been added to the suite of point cloud processing software directly available from Leica Geosystems. Developed by Technodigit SARL, a Hexagon company, 3DReshaper enables users of laser scan data to create smooth surface models of very complex 3D geometry surfaces. This capability is especially useful for laser scanning applications involving heritage, archaeology, architecture, ship hulls, and terrain mapping among others. Hexagon is also the parent company for Leica Geosystems. (Norcross, Ga., 03 September 2009) District Attorney Joe Mulholland of the South Georgia Judicial Circuit added yet another legal case reference to the growing number of U.S. court cases in which Leica Geosystems 3D laser scan data has been admitted into evidence when he successfully proffered and tendered to the jury a visually compelling Leica TruView. During the murder trial of Antonio Jerome Greenlee in Decatur County Superior Court, witness and crime scene investigator, Andy Forte of the Thomas County Sheriff’s Department, used Leica TruView to virtually place the jury at the crime scene and to show them how the homicide could have occurred. The case stems from the homicide of 21-year-old Ebony Clarke of Bainbridge, GA, who was shot and killed on August 12th, 2008, during a street altercation between two men. Leica TruView is a free, web-enabled panoramic point cloud viewer that allows users to view, pan, zoom, measure and markup the incredibly rich point cloud captured by the Leica ScanStation 3D laser scanner. The Leica ScanStation allows investigators to first photograph and then make millions of measurements of a crime scene in just a few minutes thus “freezing the scene in time” forever. A Leica TruView data set can then be generated in minutes after scanning for briefings or analysis or as in this case as a jury exhibit. Mulholland went on to say that after the trial the judge called him to the bench and commented on how effective the use of the Leica TruView was and encouraged him to use it again. “We certainly plan on doing so. The scanning software was absolutely fantastic” said the D.A. The judge also contacted Thomas County Sheriff R. Carlton Powell to thank him for his agency’s assistance with the case and to compliment him on the professional nature of the exhibits generated by his investigators. Sheriff Powell was instrumental in bringing ScanStation technology to Georgia law enforcement and has made it available to the Georgia Bureau of Investigation and other agencies as a courtesy. Those who use Leica Geosystems products every day trust them for their dependability, the value they deliver, and the superior customer support. Based in Heerbrugg, Switzerland, Leica Geosystems is a global company with tens of thousands of customers supported by more than 3’500 employees in 28 countries and hundreds of partners located in more than 120 countries around the world. Leica Geosystems is part of the Hexagon Group, Sweden.